Jerry Harris, 14, at home in Coppell with his 9-year-old sister Abbey. Susie Evans is a single mom who works with special-needs kids in the Carrollton-Farmers Branch school district. Abbey is the sister Jerry always wanted -- she was adopted when he was 5, and he even got to name her. Like most 14-year-olds, Jerry Harris is out of school for the summer. That means time to take it easy and hang out with friends. But for Jerry, it also means a contract -- one that he wrote -- to start many mornings at 5:30 a.m. and, as he printed in block letters, to "WORK." Jerry's one of the students KERA is following all the way through high school in the series Class of '17, part of the station’s American Graduate initiative. And as tough as that summer contract might be, even tougher is what comes in just three weeks: high school. It’s a hot summer day in suburban Coppell. But inside the home of divorced, single mom Susie Evans, it’s comfortable for Jerry and his 9-year-old sister, Abbey. Abbey needs to catch up on multiplication, Mom says. Jerry, so strong in the subject he’ll enter high school math a year ahead, helps teach her. The contract says Jerry will read up to an hour every other day, and rise at 5:30 three days a week to shoot baskets at a nearby court. Ok, he loves basketball and doesn’t mind getting up early. The contract also stipulates that he’ll practice typing every day, which should help with his learning disability, something called dysgraphia. And he promises to help with dinner, and WORK as much as he can. Or Mom’ll deny him video game access. There have to be consequences, she says, something she learned from her father, who was the first in his family to attend college. He swore by hard work. Evans has herself worked hard to convey that message. In this house, crosses hang in several rooms, and core values center on family and faith. She remembers when they adopted Abbey. There’s a favorite photo of the family before the divorce, taking the judge’s oath. Jerry's front and center. 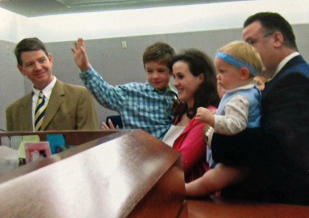 Jerry, 5, raising his hand to take the judge's oath when Abbey was adopted. Mom Susie holds Jerry. Dad Brian Harris, dark suit, holds Abbey. Their attorney looks on. Jerry, who at age 5 kept asking his parents for a sister, even got to pick her name. Mom promised he’d be the first to hold her. So he got in line right after his parents, and in front of his grandparents. Today, he says all he wanted back then was a playmate.“Like I’ll wrestle with her, go play basketball with her. This summer between middle and high school has involved more than Jerry’s contract. He spent a month with his father in Oklahoma. There’s a possible late summer vacation with his mom and Abbey. And looming out there is freshman year at Coppell High, just 20 days away.